I first tasted Georgian food as an exchange student in Moscow. My host mother Masha introduced me to it on nights her boyfriend Igor wasn't home, since he couldn't abide the garlic that permeates nearly every Georgian dish. This was one of my favorites, the tender fried eggplant forming a finger-friendly pocket around its pungent filling, nutty and creamy and herbal in a way I'd never experienced before. Five years later, when I took a job teaching English in Georgia largely in order to cook and eat this food every day, my Georgian host mother Shushana taught me her recipe for this dish, on which my own is based. (For instance, I have omitted the ground marigold petals that add color to many Georgian dishes, since they are all but impossible to find in the US.) She would make it for dinners when guests were expected, placing a platter of filled pockets on the table along with slices of thin, cheese-filled khachapuri pie, sweet peppers stuffed with rice and ground beef and herbs, simple salads of cucumbers and tomatoes so red and ripe they made my tastebuds stand on end, and plastic jugs of homemade wine. Georgians make this dish with "Italian" eggplants, which are smaller than the elephantine specimens found in most American grocery stores. Either will work for this recipe, but it's easier to cut, fry and eat the narrower version, which are often available at farmers' markets. Ground fenugreek, which traveled along the ancient Eurasian trade routes from India to Georgia, imparts a slightly tart, nutty flavor and is worth seeking out. It can be purchased in small quantities from stores that sell bulk spices, or online at Penzey's. 1. Wash and cut the tops off the eggplants. Do not peel. Cut lengthwise into ¼ in.-thick slices. 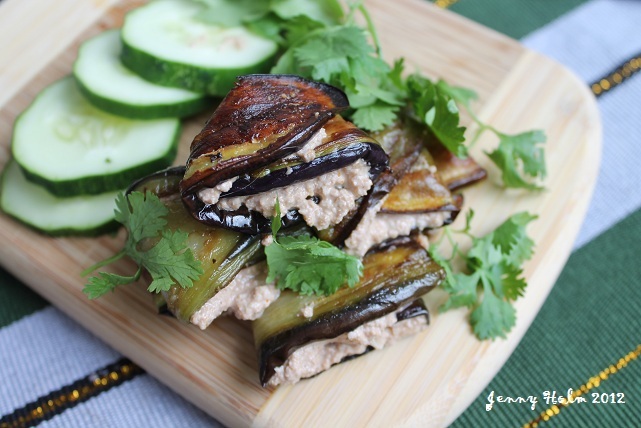 If using large globe eggplants, cut slices in half lengthwise to form 2 in.-wide strips. Sprinkle the slices generously with salt and let stand at least 30 minutes, then rinse in a colander, pressing out any bitter juice. Pat dry. 2. Heat a thin layer of oil in a skillet over medium heat. Brown eggplant slices on both sides, working in batches so as not to crowd the pan and adding oil if they start to char or stick. When both sides have turned a deep golden brown, remove fried slices to a plate lined with paper towels. Continue until all slices are fried and set them aside to cool. 4. Spread a generous layer of filling on one side of each eggplant strip. For longer strips (from the center of the eggplant), fold in half crosswise (enclosing the filling) and then in half again to form a square pocket. For shorter strips, fold the top and bottom ends in toward the middle, layering one end on top of the other. Arrange the pockets on a platter and sprinkle them with fresh cilantro, flat-leaf parsley or pomegranate seeds (if desired) to serve.